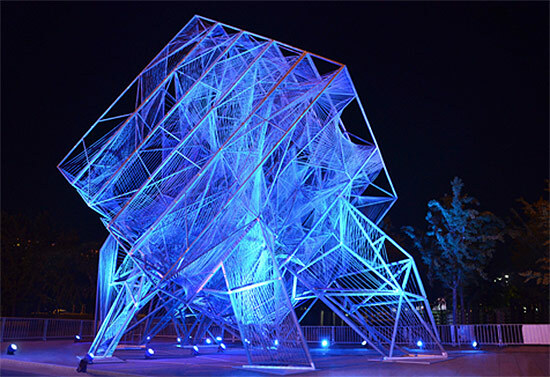 One of our favorite duos, Oyler Wu, recently completed its biggest installation to date: The Cube, a twisting, glowing steel and wire concoction for the 2013 Beijing Biennale. 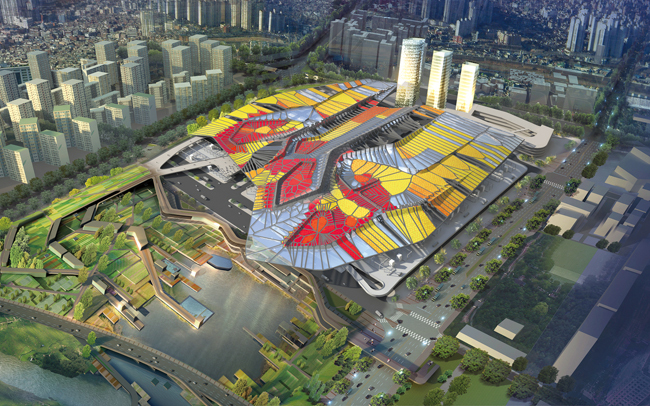 The dramatic project is now touring China, but when pressed for the latest news the firm admitted that it is not sure where it is. So if you spot a giant cube somewhere in the country, please give them a ring, will you? 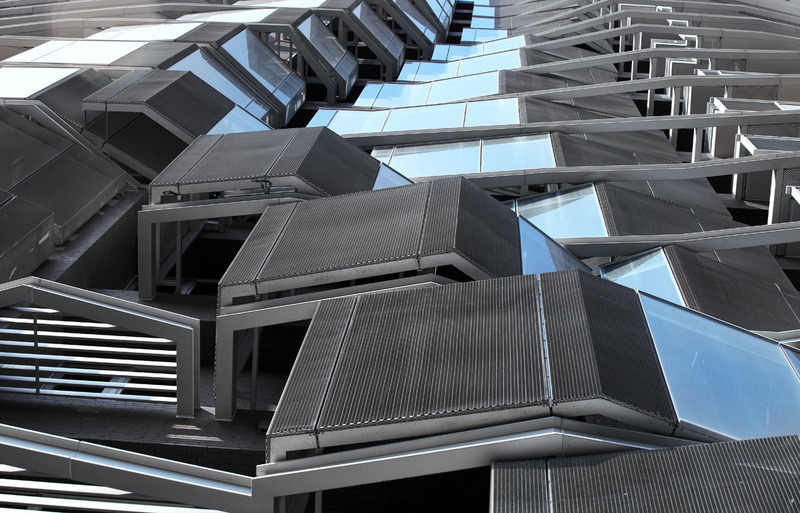 After creating their 2011 and 2012 graduation pavilions for SCI-Arc, Oyler Wu has once again produced a striking structure LA-based school, this time on the occasion of their 4oth anniversary. 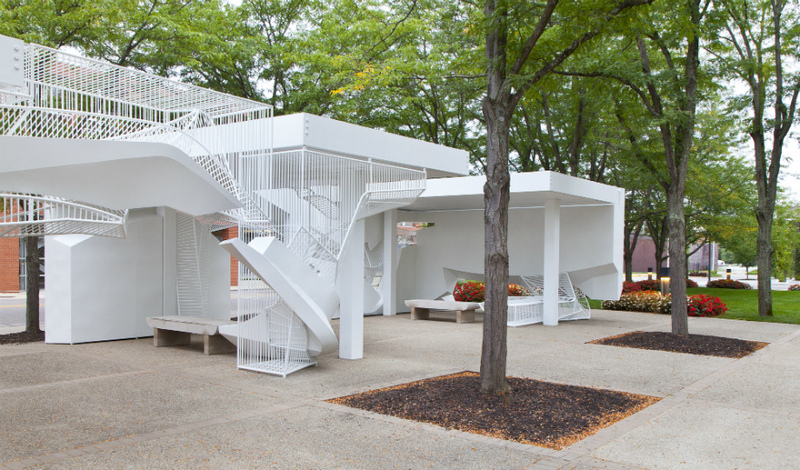 Dubbed the Storm Cloud pavilion, the structure salvages the existing steel from the 2011 Netscape, which served as the school’s graduation pavilion two years ago. Looking at Storm Cloud, one can hardly tell it shares much of the bones that made up the older pavilion. 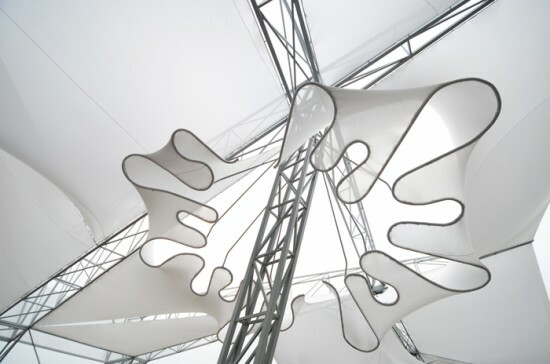 “Since the event is in the evening, we wanted create a canopy that has a lantern-like effect when lit, so we came up with the idea of creating funnels that we can place lighting inside of them,” said Oyler Wu principal Jenny Wu of the pavilion’s inspiration. Though the idea was elegant, the couple was challenged by the nature of the stretch fabric itself, which didn’t lend itself to shapes other than a simple rectangle or circle. 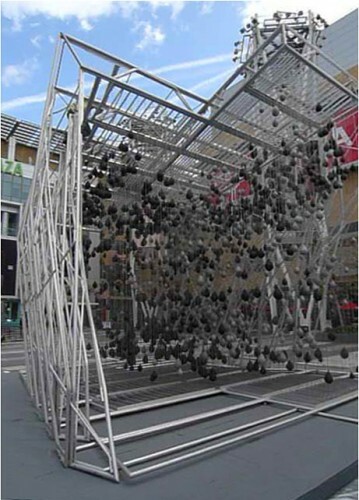 Oyler Wu overcame this challenge by adopting a “splat” strategy. “This allows us not to have to pattern it,” writes Wu. Instead of cutting uniform, predictable shapes, the pair cut waves at the bottom of the fabric and stretched over the steel structure. Wu provided a clarifying seam drawing explaining her point. 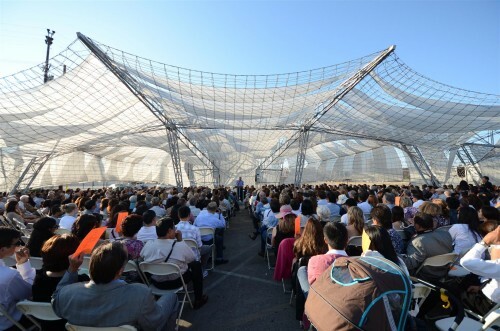 The result was a dynamic shade structure that undulated at its based and stretched taut meeting the sky. Lit with colored lights at night, the pavilion was a fitting structure to emphasize the school’s experimental bent and couple’s continually surprising investigations into form. 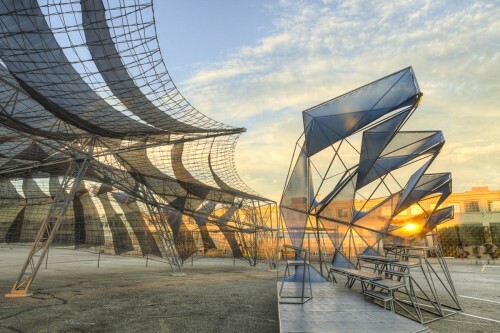 Last year we showcased Oyler Wu's SCI-Arc graduation pavilion, a swooping steel, fabric, and rope construction that floated above the event like a billowing sail. For last week's graduation the firm added a small addition while making significant improvements. The addition, which sat school directors and special guests, became a stage for diploma presentation. 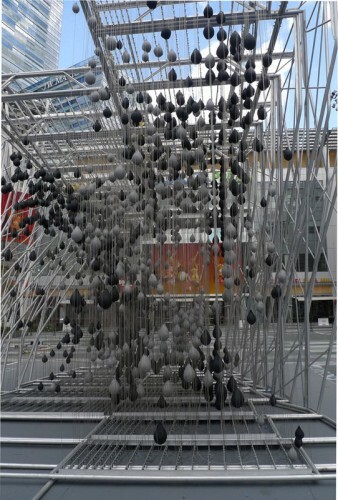 Made of a torqued steel shell fitted with twisting fabric (Wu calls it a three dimensional twist), the addition is no replication: it creates a simpler, more unified complement to the original, which involves a more complex web of fabric and roping. As for the original pavilion, they replaced its (disturbingly) dirty fabric with darker material and re-oriented the whole thing toward the school itself. Next year's pavilion will be designed by Marcelo Spina. We can't wait. 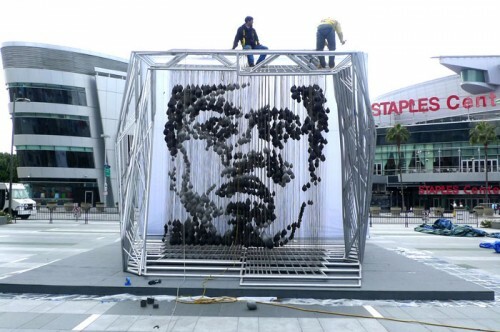 Our friends at Oyler Wu are putting the finishing touches on their collaboration with artist Michael Kalish that brings a pixelated face of Muhammad Ali to L.A. Live's plaza in Downtown Los Angeles. 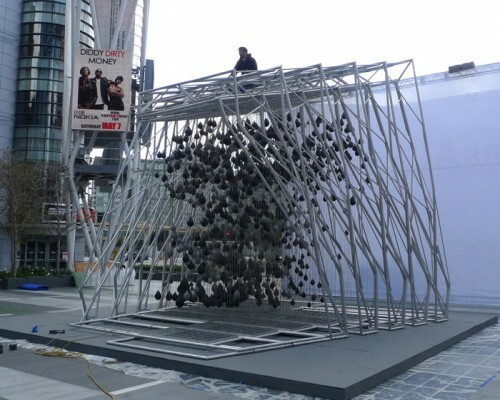 The sculpture, reALIze, which has its official unveiling tomorrow night, consists of a large frame of hundreds of aluminum tubes on which 1,300 speed bags are hung via steel cables. From most angles it looks like a bit of a jumble, but from straight on, the composition of light and dark bags indeed forms an impressive likeness of the champ.